EFECS (European Forum for Electronic Components and Systems) is the international forum with a focus on ‘Our Digital Future’ along the Electronic Components and Systems value chain in Europe. The organisers of this event, AENEAS, ARTEMIS-IA, EPoSS, ECSEL Joint Undertaking and the European Commission joined forces to bring all stakeholders together on 5-7 December 2017 and focus on this years’ theme: ‘Our Digital Future’. In the context of EFECS, the Poster by WinSiC4AP has been exhibited in the ENERGY section of the Exbithion. 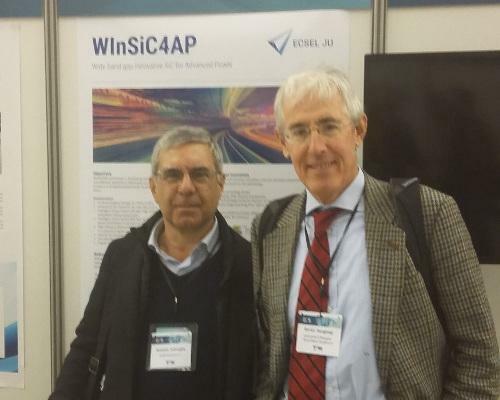 Present Antonio Imbruglia of STMicroelectronics and the prof. Enrico Sangiorgi of the University of Bologna (IUNET).